Postlude: Christ Hath Burst His Prison! Let us know your special days so that we may celebrate with you. Want to get our E-Newlsetter? 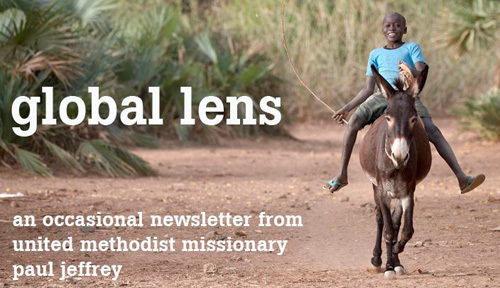 Give the church office your email address. It’s that simple. Contact the church office to program your favorite hymn in a service. Hymns need to be found in the red United Methodist Hymnal or the black In Faith We Sing hymnal. Large print hymnals are available and located by the sanctuary doors. 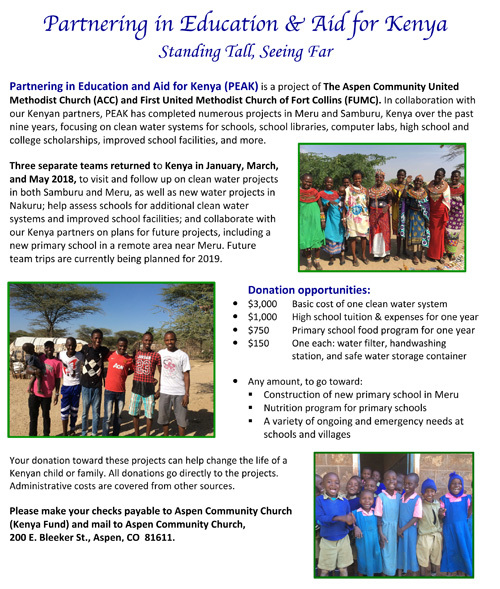 The Aspen Community Church’s outreach and work in Kenya is now in its eighth year – an amazing effort in partnership with other churches and Rotary International – currently providing clean water to thousands of students and teachers at more than 40 schools. Read about Kenya PEAK. A gathering place for musicians to rehearse and perform, groups to meet, yoga, AA and NA meetings and a place for those needing to find support. See our calendar of events. The Aspen Community Church building was built in 1890 and has been the home of a Presbyterian congregation, then a federated congregation in the 20’s and became a Methodist congregation in the 30’s. It has served many generations of people in Aspen. Recognizing the outstanding acoustics of the sanctuary, John Denver and the Dickens Carolers recorded their Christmas album here. For so many Aspen families, the Community Church has been a special place to worship, celebrate and grow in faith. Read about our history. We have received generous donations of $7,200 for two new ranks of pipes, (a 2 2/3 salicional and a 1 3/5 aeoline) for our wonderful organ, making it the largest organ on the Western Slope. To make it more fully functional and on par with other organs of its caliber, we also need a donation of $3,700 for new toe pistons and a zimbelstern. The toe pistons make more settings available using the feet rather than the hands to change the registrations of the organ and the zimbelstern would add another timbre to the organ. Please consider making a special gift so that we can get all these installations completed in mid-May during our scheduled maintenance time. By doing them together, there are considerable savings over having them done at two separate times. Many thanks. The United Methodist Church took a huge step backward at a specially called General Conference in February of this year. It reaffirmed and strengthened anti-gay language in our rule book which we call the Discipline. At Aspen Community Church, we categorically reject what was done. Out Mountain Sky Conference also is pushing back so that the fundamentalists do not take over our denomination. If you want to see how our annual conference leaders responded to the General Conference, you can watch this video of their “summit” from Hope UMC. There will be much to do over the next months as Aspen Community Church reaffirms our commitment to be inclusive of all people. We reject any discrimination based on sexual orientation or any other of the many ways people are categorized and then pushed to the margins of our society. We welcome all people to join in our fellowship that attempts to display the love of all God’s children (every human on earth), something that was so clearly modeled by Christ who is truly the head of our church. Also included is a message from the Western Jurisdiction College of Bishops. You may also make a secure donation online at www.aidforkenya.org or HERE.